PASADENA — LitFest Pasadena will be held throughout the Pasadena Playhouse District on Saturday, May 20, from 11 a.m. to 10 p.m. and Sunday, May 21, from 11:15 a.m. to 5 p.m. The event celebrates its sixth year with a packed weekend of readings, authors’ panels, poetry, and celebrity guests — programming for all ages and interests. Presented by the nonprofit arts and education organizations Light Bringer Project and Literature for Life. • “Sunshine Noir” on Saturday at 11:15 a.m. at Vroman’s Bookstore, 695 E. Colorado Blvd. Join a lively panel of L.A. mystery writers as they explore the inspirations, challenges, and adventures involved in writing about crime, danger, mystery, death, and even evil in the land of sunshine, surf, and optimism. 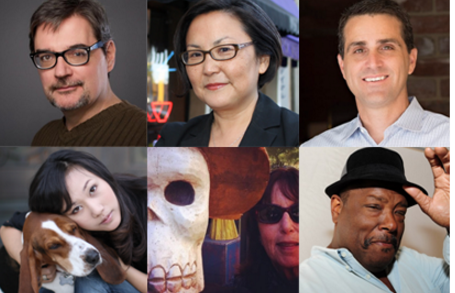 With Naomi Hirahara (“Sayonara Slam”), Steph Cha (“Dead Soon Enough”), Phoef Sutton (“Heart Attack & Vine”), Adam Walker Phillips (“The Silent Second: A Chuck Restic Mystery”), Jo Perry (“Dead Is Better”), moderated by Gary Phillips (“The Cocaine Chronicles”). • “Cute Filipinos on a Saturday Afternoon” on Saturday at 2 p.m. at Walt Girdner Photo Studio and Gallery, 27 S. El Molino Ave. In the Raymond Chandler novel “The Big Sleep,” a female character asks famed detective Philip Marlowe if she looks cute. Marlowe responds with “Cute as a Filipino on a Saturday night.” This reference to a community in 1930s Los Angeles has drawn ire and confusion – what does it mean? The panelists will reflect on writing about and by the second-largest Asian American group in the U.S.
With Boni Alvarez (“America Adjacent”), Cecilia Manguerra-Brainard (“Magdalena”), Angela Penaredondo (“All Things Lose Thousands of Times”), Chris Santiago (“Tula”), moderated by Noel Alumit (“Letters to Montgomery Clift”). • “10 Distinguished Local Poets” on Saturday at 2 p.m. at Vroman’s Bookstore. These award-winning poets include national award winners, Pushcart Prize nominees, noted lecturers, publishers, editors, and locally renowned poet performers. They are well-known in the greater Los Angeles poetry community and all were published in the 2016 and/or 2017 nationally recognized “Altadena Poetry Review Anthology.” Moderator Thelma T. Reyna is poet laureate emerita of Altadena and a winner of eight national book awards, most of them in poetry. With Beverly M. Collins, Carl (CaLokie) Stilwell, Kathee Bautista Gloriana, Casey Damian Gonzalez, Annette Wong, GT Foster, John Wiltshire, Martina Gallegos Robles, Pauli Dutton. • “The Los Angeles Literary Community” on Saturday at 2 p.m. at Sculpture Plaza-The Stand, 36 S. El Molino Ave. Los Angeles has a large and varied literary community with disparate but large and varied reading publics. The editors of the Los Angeles Review of Books will discuss how the literary community in L.A. has changed, evolved, where it may be located and whether it will ever be centralized. With Medaya Ocher, managing editor (moderator); Boris Dralyuk, executive editor; Janice Rhoshalle Littlejohn, senior editor; Steph Cha, noir editor; Michelle Chihara, economics and finance editor. • Reiyukai America hosts crafting with recycled materials (children and family event) on Saturday at 3 p.m. at Pasadena Central Library, Great Hall, 285 E. Walnut St.
• “Refugee America” on Saturday at 3:30 p.m. at Vroman’s Bookstore. Some of us can’t go home because home doesn’t exist anymore. With refugee crises and debates around immigration exploding all over the Western world, this panel of novelists whose works explore the refugee experiences of displaced Sri Lankans, Guatemalans, and Iranian Americans speak to a subject as dire, contested and vital as any our world. With Laleh Khadivi (“A Good Country”), Nayomi Munaweera (“What Lies Between Us”), Soma Mei Sheng Frazier (“Salve”), moderated by Keenan Norris (“Brother and the Dancer”). • “The Humor and Heartbreak of L.A.” on Sunday at 11:15 a.m. at Pasadena Playhouse, Friendship Room, 39 S. El Molino Ave. L.A. Times columnist Jack Smith once wrote, “The real Los Angeles is invisible.” Critic and essayist David Ulin (“Sidewalking”) moderates a conversation with four novelists who have all set stories in L.A, with varying degrees of humor and heartbreak, realism and imagination, fame and invisibility. What makes L.A. work as a setting for these perceptive novelists? With Nina Revoyr (“Lost Canyon”), Lian Dolan (“Helen of Pasadena”), Christopher Noxon (“Plus One”), Dana Johnson (“Not Quite Dark”). • “The Tomorrow Prize! Dramatic Readings of the Best in Short SciFi by L.A. County’s Teens” on Sunday at 2 p.m. at Sculpture Plaza-The Stand. Special guest performers including Jasika Nicole (“Fringe”), Jonathan Slavin (“Dr. Ken”), Peter Mackenzie (“Black-ish”), David Blue (“Stargate Universe”), Anna Maria Horsford (“The Bold and the Beautiful”), and Graham Sibley (“Fear the Walking Dead”) will treat audiences to dramatic readings of the works of six finalists for The Tomorrow Prize. After the reading, prizes will be awarded to the top story writers. Finalists include Samuel Fischbach (“Aether.Reality”), Leslie Le (“The Dead Light”), Richard Magdaluyo (“Earth II”), Jonathan Herbst (“A Helping Hand”), Joseph Springer (“The Most Satisfying Sound”), Ekaterina Zhosan (“The Multiverse Theory”). Honorable mentions include Cira Davis, Zachariah Nash, Angelica Pico, Allison Pleitez, Vianni Valle, Paula Wang. • “The Impossibility of L.A.” on Saturday at 3:30 p.m. at Trio Courtyard (behind and between Bank of the West and Tender Greens), 587 E. Colorado Blvd. Los Angeles is a city like no other, one that countless writers have attempted to tell the tale of. Artists, entertainers, moguls, immigrants, commoners, it’s a world city and the world within a city. So how does any one person write about it all? With Daniel Olivas (“Things We Do Not Talk About: Exploring Latino/a Literature Through Essays and Interviews”), Chiwan Choi (“The Yellow House”), traci kato-kiriyama (“signaling”), moderated by Mike Sonksen (“Poetics of Location”). • “On Blooming” on Sunday at 3:30 p.m. at Sculpture Plaza-The Stand. Presented by Tunnel Magazine, an online and irl art community for young people, based in Los Angeles but drawing submissions from around the globe. Editors of the magazine, all teens, discuss the importance of creating and sharing art in a short panel. This will be followed by an open mic and artmaking workshop, focused on sharing ideas about the teen experience. Accompanied musically by Nathaniel Stephens and Timothy Franco. Coordinated by Amelia Anthony, the magazine’s editor, and Brandon Yung, a contributing writer. • “Fusion-Ha! : Manga Influences on American Comic Books” at 3:30 p.m. at Pasadena Playhouse, Makineni Library, 39 S. El Molino Ave. Sailor Moon! Pokemon! DragonBall Z! Today, we are seeing the impact manga and anime have had on American comics and culture, from Nickelodeon’s show “Avatar: The Last Airbender” to Marvel and DC’s manga-influenced artists Babs Tarr (“Batgirl”), Annie Wu (“Black Canary”), and Kris Anka (“Captain Marvel”), to the rise of award-winning webcomics Megatokyo and MFK. Panelists will discuss manga’s effect on American comics and what that means for the future. With Johnny Parker II (“Broken”), Brandon Easton (“Vampire Hunter D: Message From Mars”), Lillian Diaz-Przybyl (Sparkler Monthly), Nilah Magruder (“M.F.K.”), moderated by MOM (“Issues Tome 1: Strong Female Lead”). For more information, visit http://litfestpasadena.org.